The Sámi people have never been large in numbers. Today, it is estimated that there are between 60-80 000 Sámi living in Norway, Sweden, Finland and Russia. Several criteria are used to determine Sáminess: language (i.e. those who speak Sámi themselves or have at least great grand parents that did) or ethnic and cultural belonging. Approximately half of all Sámi live in Norway. 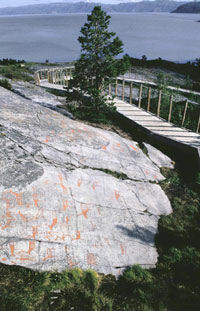 Historically, the Sámi culture forms part of the Arctic cultural area. These have been the ecological background for Sámi hunting and trapping methods, dwellings, means of transport, language, and pre-Christian religion. There are similarities that can be found between the Sámi and the cultural traits of other Northern peoples in the Artic. At the same time as there are cultural differences between the Sámi’s an indigenous on Greenland, in Siberia and in North America. "Instead of the formally constituted monuments of the kind that have dominated the landscapes of prehistoric Europe, Artic archaeology is concerned with the significance of unaltered places. In the case of the Saami, it is possible to specify some of the physical characteristic of the locations that were chosen, and also to identify a number of the processes that took place there. These were unusual features of the natural topography – features that stood out from the surrounding country, some of which recalled petrified people and animals – but they are even more important because we know a certain amount about their significance in Saami cosmology. The stones and other features that were selected from the wider terrain were credited with special powers and allowed contact with the supernatural. Those contacts were made through sacrifices that were entirely integrated into the daily lives of the Saami. At the same time, these places were only the visible signs of a complex cosmological scheme that involved three different worlds. These came into contact at natural locations such as caves and mountains."